Roaches are unpleasant just to look at, but the main concern is they’re capable of transmitting diseases. Just one or two of them wouldn’t be too bad, but they don’t come in one or two. If you see one, you probably have a few hundred hidden in the area. There are many ways to eliminate them including expensive exterminators and dangerous toxic chemicals, but you have a cheaper and safer option. You can effectively get rid of roaches using boric acid roaches powder IF you avoid making these three deadly mistakes that will render your efforts completely useless. You can buy boric acid for killing roaches from Amazon.com. Also, don’t forget to buy a bulb duster to apply the correct amount of dust. For those of you a little short on time, this is the biggest mistake you can make. The biggest mistake you can make is to not use boric acid with a roach bait (such as the Advion Syngenta Gel Bait). They both possess the same roach killing power and they both work the same. 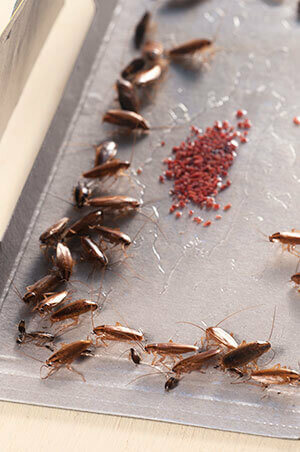 Using boric acid and roach bait together will almost double the speed of eliminating those pests. Boric acid can be found naturally in many fruits and other plants. The stuff you’ll be using is produced from borax mined from mineral deposits. While highly toxic to cockroaches and other insects, boric acid is fairly harmless to humans and pets when used accordingly. For a completely non-toxic roach killer, use food grade diatomaceous earth. Roaches crawl through the boric acid powder and the tiny particles cling on to their bodies. When they clean their bodies by licking themselves clean, they ingest the boric acid (which acts as a stomach poison). They die shortly after. Since roaches are not very picky eaters, the roaches killed from the poison is eaten and the cycle continues. It also sticks on to food dragged through it. When the food is brought back for other roaches to eat, they all feast on the poison. Don’t like the idea of dead roaches everywhere? You can try to keep them away with these electronic pest repellents instead. Although, I personally feel the best way to deal with them is to make sure they can’t return. The biggest mistake that many make when they use boric acid is applying too much of it. If a roach walks into a wall of boric acid, what do you think it will do? It certainly won’t waste the effort to climb over it when walking around it makes more sense. A little goes a long way here, so dust a very thin layer. An almost invisible layer is what you should be shooting for. You want to use just enough so that you can barely see the layer of boric acid with your naked eyes. To be honest, to get this perfect, you’ll need a decent bulb duster. If you’re using the commonly found squeeze bottles, make sure the opening for the cap is small. Cover the opening with your finger, give the bottle a good shake or two and then quickly squeeze out a thin layer onto the area. You’ll have to do this every time you need to apply the dust. It’s a hassle, but if don’t have a bulb duster, you will need to do this frequently or you’ll be wasting your time. Just as important is where you apply the powder. Applying it in areas where roaches do not frequent, or away from where they’re living is ineffective. Find out what type of cockroach you’re dealing with and where they like to hide (to catch some for easy identification, use glue traps). Then dust those high traffic areas, and favored hiding spots with boric acid. This ensures that they help spread it to the rest of them fast. Most of them like dark places, so areas like under the stove, refrigerators, and the hollow spaces underneath cabinets are great areas to target. Also look for any cracks, or openings in the walls nearby. Squeeze some into them if you find any. You may also want to observe where you see them most. Try this to get a good idea of where they are. At night, leave the lights off for a few hours. Then walk into the affected room, turn on the lights and see where they are most concentrated or where they scatter off to. Let them show you where they’re hiding and treat those locations. When people hear about how great boric acid is, they get tunnel vision and make the mistake of thinking that’s all they should use. It’s good that you’re putting in the effort to learn how to use boric acid properly, but don’t limit your success rate. What do I mean by that? Simply put, don’t use just boric acid alone. Combine boric acid with other methods to get even better results. Now, there are good combinations and there are bad combinations. Blindly combining multiple solutions is a mistake in itself that you want to avoid. A glue trap will stop the chain killing effect that makes boric acid so great–because they can’t return to the nest to poison the others. What will work well with boric acid and what won’t? Let’s start with what won’t work well. Don’t use monitor traps (glue traps) beyond the identification phase if you’re using boric acid. A cockroach killed through contact with boric acid becomes a cockroach killer itself. Thanks to the fact that cockroaches will eat other dead roaches, this works great to our favor. Well, that’s assuming an affected cockroach is able to make it back to the nest. Using roach traps completely nullifies this. It gets stuck in the trap and doesn’t return to the nest to kill the others. Fast acting contact killers like DemonWP can kill them within just seconds, but they work against boric acid. They die way too fast; thus being unable to return to the nest to kill the others. If you want faster results, and your okay using synthetic pesticides, then stick to contact killers and glue traps. 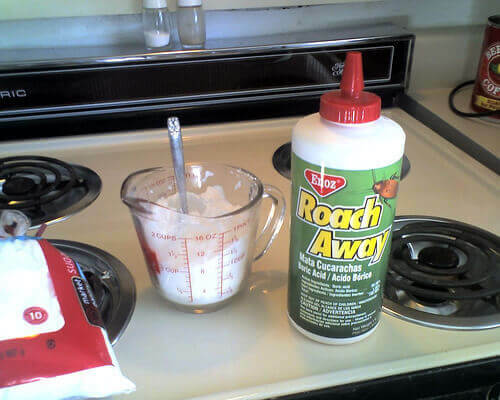 Other home remedies that will repel, or keep roaches away may not work too well with boric acid. The probem is, you want the roaches to make contact with the boric acid. Using a repellent that will stop them from touching the powder will only make things harder. Also, if you’re in the early stages of dealing with baby roaches, you might wan to hold off for a bit until you’re certain it’s under control. What will work well then? Roach baits such as the Advion Roach Gel work great with boric acid. Roaches killed by baits will also become a cockroach killer (the same effect as boric acid). In fact, some gel baits use boric acid as the active ingredient to kill roaches. Another advantage to using these roach gels is they’re mixed with a powerful attractant that roaches can’t resist. You can also apply the gel in places where you can’t apply boric acid powder (like under the cabinets and around the trash can). This stuff is professional grade, so it isn’t easy to find at most stores locally, so I always recommend that people buy it from Amazon. You can also try forcing the roaches into your “trap” of boric acid. To force them out of hiding and make them concentrate in the area where you’ve applied boric acid, use a bunch few of these Riddex electronic pest repellents. These are designed to keep roaches away, but you can use it force the roaches to concentrate in an area. Plug one or two of them into all the other rooms. For me, I know they concentrate in the kitchen, so I plug them into all the other rooms except the kitchen. These can get a little pricey, but luckily, there’s an offer right now for buy 1 get 1 free. If you’d like to try this method out, save yourself some money and buy it here before the offer ends. All you have to do is apply this powder in a thin layer in the correct locations and let the roaches kill themselves. It’s what makes this boric acid roaches method so great. It will take some time for them to die off, but stay consistent with the treatments. Depending on how severe the infestation is, it could take a couple of months before they are completely gone. You should see a drop in their numbers within the first 4 weeks of treatment though. Also follow some preventative measures to not attract more of them and consider combining other removal methods to increase your chances. Get rid of them asap, because they do spread disease.